If you’re interested in paddle boarding, the good news is that there are many types of paddle boards that cover just about everyone and for nearly every paddling condition. Paddle boarding is one of the fastest growing sports in the world, with people paddling in lakes, rivers, and waves. You can use paddle boards to do everything from fishing to yoga to surfing to racing — there’s no limit, really. Here at The Adventure Junkies, one of our big goals is to break down sports into easy-to-understand guides. 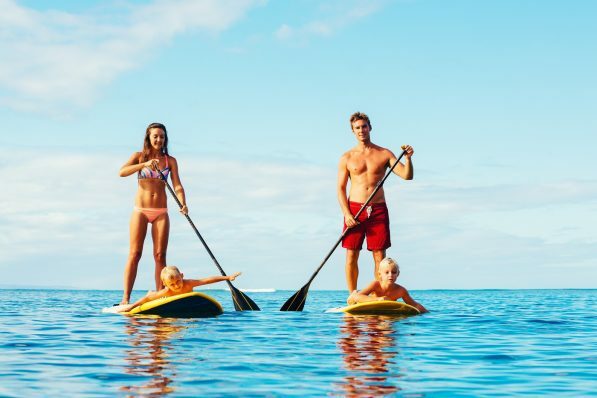 In this article, you’ll learn about the many different types of paddle boards and whether or not these boards would be a perfect fit for you. 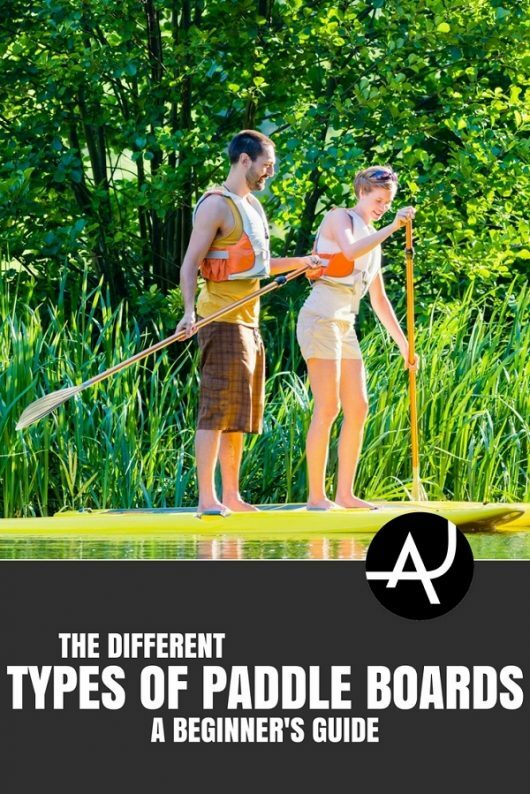 The all-around paddle board is a great paddle board for beginners and people who are unsure of what specific type of paddle board is best for them. These boards are very stable and are built to handle most conditions — like choppy flat water or very small waves. They tend to be less agile than surf paddle boards and much slower than touring paddle boards. If you are just learning how to stand up paddle board and looking for a basic but great paddle board, you won’t go wrong with the all-around paddle board. You’ll never know what type of paddling you’ll like the most until you try it. Many paddlers who thought they’d love surfing, others love racing. Several love racing and some love surfing. An all-around paddle board lets you dabble in each discipline and perfect your paddling strategy without any real downsides. A flatwater paddle board is somewhat self-explanatory and is best for those who will mostly be paddling in flatwater and wanting to go very long distances. These boards tend to be longer and narrower than an all around board, while not quite as long or narrow as a touring board. If you’re interested in going on a paddle boarding trip where you camp along the shoreline, flatwater paddle boards could be a great option. They are typically faster than all-around or surf paddle boards and stable enough to accommodate extra gear. Many flatwater paddle boards have a storage section where you can put a tent, sleeping bag, and other amenities. Or, simply pack your lunch for the day. If you pick a route downwind, you’ll be surprised at how quickly you can cover great distances with a flatwater paddle board. Similar to a flatwater paddle board, the touring paddle board is primarily used for long distances or racing and has a long, narrow shape. A touring paddle board cuts through chop with ease and tracks in a fast, straight line. These boards require a skilled paddler to maneuver due to their length and are much less stable than nearly every other type of board. Touring boards are not recommended for beginners. With touring paddle boards, beginners tend to adopt a terrible stance and waste time focusing on staying balanced. It’s much better to get another type of paddle board that will help you perfect your stroke and tune in your balancing skills. Fishing from a stand up paddle board is a great way to exercise and cast a line. Fishing paddle boards are extremely stable and have plenty of space to store tackle gear. 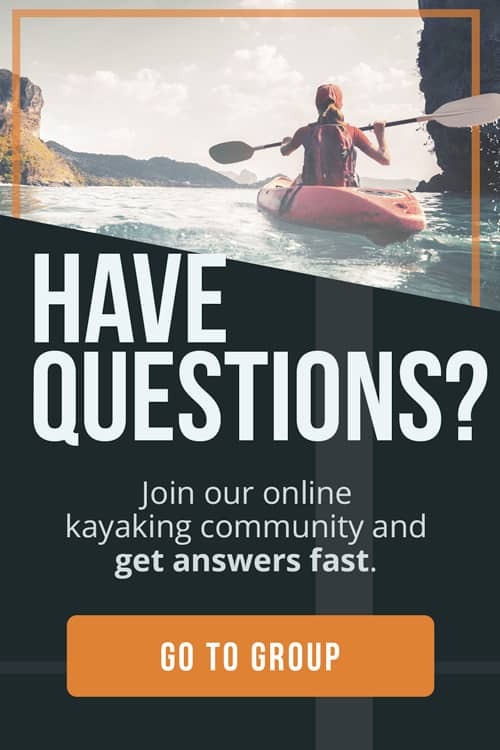 They often offer more range of movement than a fishing kayak — but beginner paddlers have to make sure they stay balanced. Some fishing stand up paddle boards come with rod holders, a built-in storage area, and even side extenders that increase stability, similar to a catamaran. The only downside to fishing paddle boards is that they aren’t as agile and tend to paddle much more slowly than other types of paddle boards. Overall, they are a great choice for beginner paddlers who need a board that’s extremely stable. 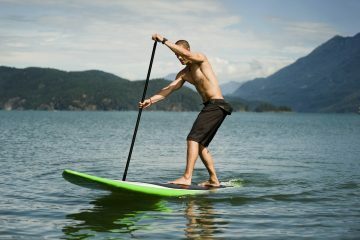 If you live near the beach or are already an avid surfer, you should look into buying a surf (performance) paddle board. These come in a range of sizes and tend to be slow to paddle, but very easy to maneuver. They are typically more egg shaped — while other paddle boards are longer and narrower. Surf paddle boards come in a variety of lengths. Beginner paddlers should choose a surf paddle board on the longer end, and take time in perfecting their stroke and balance before paddling into waves. Surf paddle boards are nearly impossible to duck-dive, so you’ll have to learn about the different parts of a wave and how to maneuver around them. 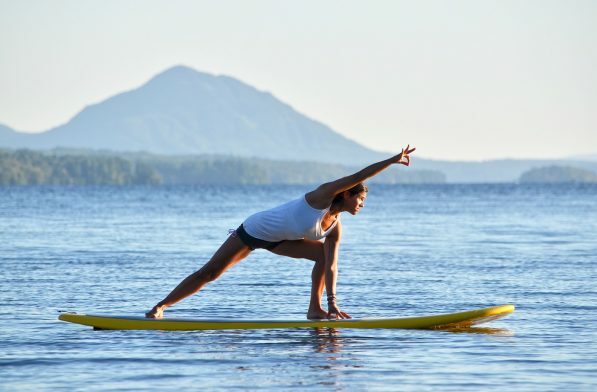 Many yogis are obsessed with practicing on paddle boards — for good reason! Doing yoga on a paddle board is a great way to improve your balance and stability with each pose. Plus, it adds an extra element of novelty and fun. Though there are only a few yoga-specific paddle boards on the market, any all-around board or surf board that is very wide and long will work. You’ll want to add a traction pad on top of the board, or else it will be too slippery to grip. While most paddlers use surf wax as paddle board grip, it won’t be the right fit for yogis. Surf wax will ruin your hair and tends to melt and move when exposed to the sun. Remember that stability is the most important factor when choosing the right stand up paddle board for yoga, so when in doubt, size up. If this sounds exciting, check out Yoga Journal’s 10 poses for beginners. Inflatable stand up paddle boards are a great choice for beginner paddlers and those limited on space. 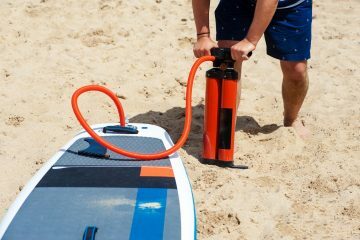 To use these boards, you simply inflate them with a pump like you would an air mattress. 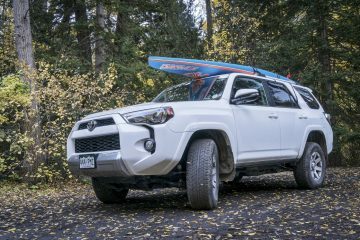 Now, instead of needing stand up paddle board roof racks, a massive vehicle, or a trailer, you can usually fit an inflatable stand up paddle board in any sized vehicle. They can also be taken on trips or flights much more easily. 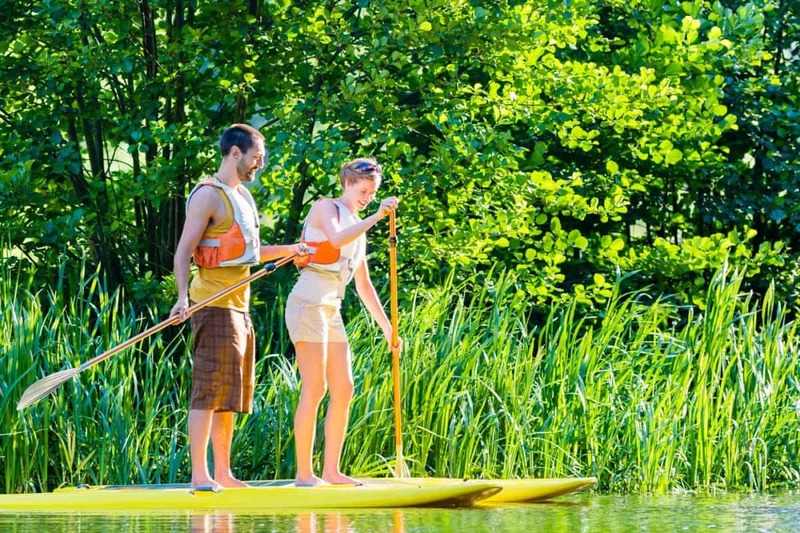 Inflatable stand up paddle boards typically cater to beginner paddlers or those wanting an all-around shape and style paddle board. They are great for people living in apartments, families, those with small cars, and are typically much less expensive than a standard epoxy/hard paddle board.